the adventures of tartanscot™: "Happy Easter . . . "
Happy Easter Scot!! love the picture. So handsome and stylish. Look at you!! How cute.. oh, sorry, handsome. 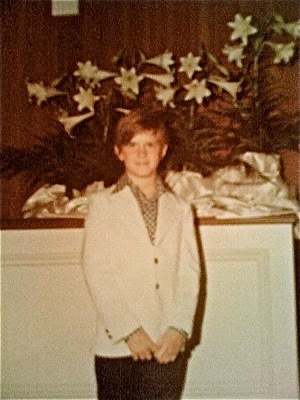 Remembering when everyone used to dress up for Easter Sunday and the church would be packed.. and Easter lilies. Happy Easter to you and the ones you love! You looked good then and now! My youngest so has exactly the same blond haircut as you had then, perhaps 12 years old? handsome and quite the tart! A fashion plate even then!! Wishing you a wonderful Easter!! Priceless! Linen and gingham, you were stylish even then. Hoping you had a great Easter Scot. Oh how chic! I think it is so wonderful that you remember that favorite shirt.....and jacket. What I would give for my very favorite sailor blouse! I remember insisting that it "still fit"! and if I had managed to get it on........it would have had to be "cut off" of me! Bravo! You were and continue to be adorable.